The form of the map seems to fit DF. Well then, that doesn't help very much, as that map doesn't line up with the DF/AQW map at all. I've added the Falcon to the Mount Thrall part of the map. Chimeran Set and the Mystery were added south of Battleon, which allowed Dragonstone to be properly placed. The Temple of Hope was moved to where it is labeled on the Travel Map. "Gulf of Kyed" label was added. Minor: Transfarmers, Bizarre Flecks, Martial Artist, Eclipsus, Terror Set, and that little dinosaur-shaped island north of Deren was changed to make it the same shape as the one on the Travel Map. Epic Quest was removed because it's not on the map anymore. I would try adding stuff from DF's map, but that thing doesn't have forests southeast of Falconreach, which is odd, because Falconreach is right on the western border of Darkovia. It also has the SandSea in an odd place that I would approximate would be where Skraeling is, rather than where the SandSea is in AQ (which is way to the west). And, of course, AQW's map is all sorts of messed up. Wait, but it totally is. Go southeast from Falconreach in DF and you'll find your way blocked by a gate. That's the border of Darkovia, presumably. It's really not far from Falconreach proper. I've now added the Darkovian Battlegrounds, Werepyre Hideout, Werewolf Lair, and Vampire Castle (Approximately). I'm not sure about the scale, since the zoom-in of Darkovia Forest doesn't quite line up with the Travel Map. The Sky Bridge has also been added. Here's a version with DragonClaw Island more detailed. Which do you prefer? That could be expected. Look at the Reset-- it combined aspects of several different PLANETS into one. Woah... are Neld, Inilar, Tjeli, the Middle Isles and Vandar part of Lore, I don't recall ever seeing them in quests... also you forgot the Maelstrom, Orodalf. Tjeli was in-game during last year's Frostval. Neld is mentioned by Galrick. Vandar is seen in the WarpForce Launch. Inilar is definitely part of Lore. I'm pretty sure Tjeli is an uninhabited, frozen wasteland while Vandar, Neld and Inilar are in ruins. Though, only mostly so in Vandar's case. I believe Vandar was abandoned at least to the best of my recollection. Ever think that AQW's map could be MORE zoomed out? because, in that case this little perspective map i made makes sense. ^: However, AQW's map is not at all useable with this cartography project. Lore in AQ and AQW are structurally different and parallel to the other, hence making AQW's map unusable. The areas are different but the shape of the continent is roughly the same for both games. ^Hoho. I wonder if that still counts as Word of God. @ Bobby: Wat? I'm sorry, but the only similarity I see is a between the rough shape of what is shown of Battleonia and the horn. And when I say rough I mean extremely so. 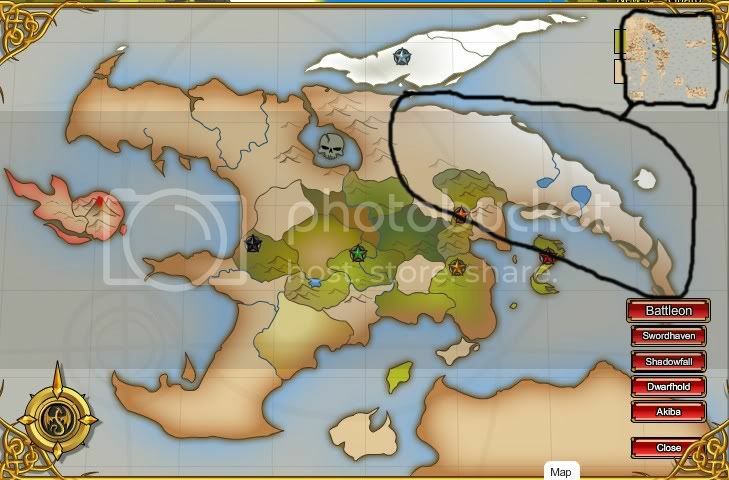 Not to mention that the AQ map is definately shown with the north up and the south down. @Maxwell: Yeah, I noticed they both follow the Dragon head motif. My point was to say, that, maybe AQ stayed to those few islands on the horn, then that'd make sense. I meant roughly similar. Well you'll notice the AQ Map in the North-west regions resembles a dragon, somewhat, whereas the AQW map is the head of a dragon, mouth open expelling a fireball. @Maxwell does that mean a new updated AQ map is on the way? I noticed the island with question marks in-game is called Bronwyn Island on the ImageShack map, is that the name of the island and where is such information divulged? Wouldn't it be easier to ask the mods just to make the maps in DF and AQW the same AQ's?